The best first: What is yellow and kills you if you get it in the eyes? What is black, cool, and stands in a forest? A deer in a leather jacket. Why has no skeleton ever jumped from a really tall building? They ain’t got the balls. Why don’t fish play basketball? They have issues with the net. I can only handle 25 letters of the alphabet. I don't know why (y). 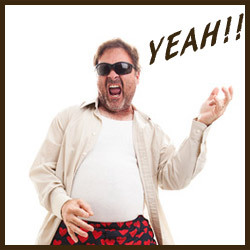 What does a traffic warden do when he wins a million dollars in the lottery? He buys himself a crossing and becomes self-employed. What do you give a pig when it’s poorly? A good oink-ment! I met Bruce Lee’s vegetarian brother today. His name is Brocko Lee. 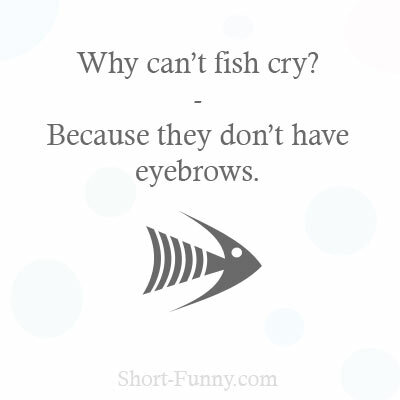 Because they don’t have eyebrows. What is white, stands in front of the stairs, and can’t go up? What do polar bears eat for breakfast? Frosted flakes. Why didn’t the toilet paper make it across the road? He met with too many cracks on the way. What tea is it not a good idea to drink? What happened on the 1.1.1111? Why is it pointless to play hide and seek with mountain ranges? What is yellow and kills you if you get it in the eyes? 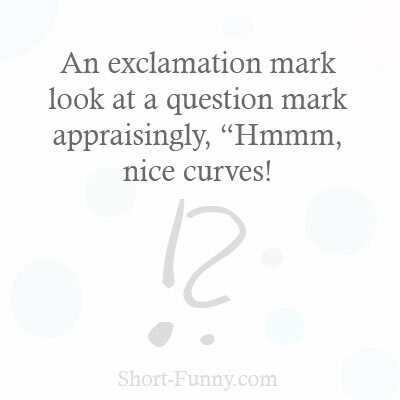 An exclamation mark look at a question mark appraisingly, “Hmmm, nice curves! ”What did Jasmin rice say to Asian vegetables? Don't you wok away from me! What brand of car does an Egg drive? What’s the difference between a wasp and a fly? A wasp can fly, but a fly can’t wasp. Why is there a donut sitting at the dentist’s office? It’s there to get a filling. What kind of cake is the most popular one in cake shops? And the second most popular? What is black and white and sits on a swing? Why do fish make such lousy tennis players? They’re afraid of coming close to the net. Are insecticides good for mosquitos?" Not at all, it kills them!" “What to call a bear who’s lost all its teeth?